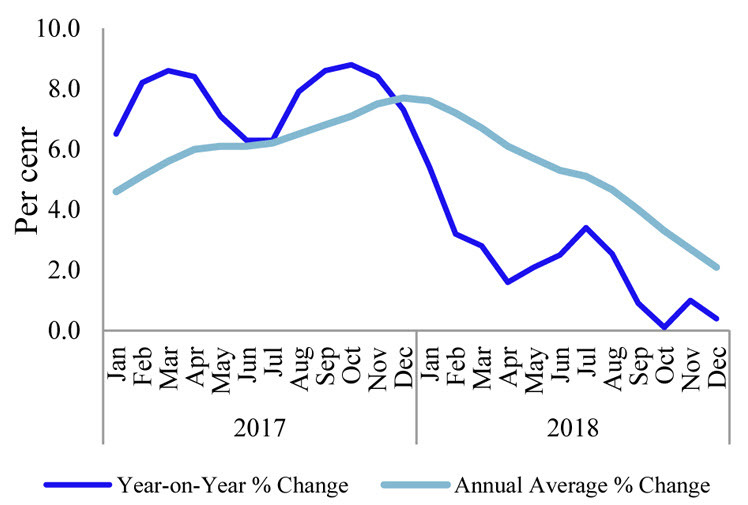 Headline inflation as measured by the year-on-year change in the National Consumer Price Index (NCPI, 2013=100) decreased to 0.4 per cent in December 2018 from 1.0 per cent in November 2018. The decrease observed in year-on-year inflation in December 2018 is driven by the decrease of prices of items in both Food and Non-food categories. Year-on-year Food inflation decreased to -4.5 per cent in December 2018 from -3.9 per cent in November 2018 while year-on-year Non-food inflation also decreased from 5.2 per cent in November 2018 to 4.7 per cent in December 2018. Moreover, prices of items in the Communication; and Alcoholic Beverages and Tobacco sub-categories also reported decreases during the month. At the same time, prices of the items in the Food category decreased where vegetables, limes, big onions, banana and coconuts recorded prominent decreases. The core inflation, which reflects the underlying inflation in the economy, remained at 3.1 per cent in December 2018 on year-on-year basis. Meanwhile, annual average core inflation also remained unchanged at 2.4 per cent in December 2018.